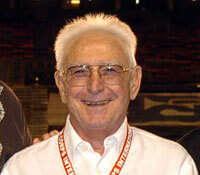 Inducted as part of the DCI Hall of Fame class of 2006, Alfred "Corky" Fabrizio, spoke to family, friends and other members of the drum corps community last year at the official Hall of Fame luncheon ceremony in Atlanta. Fabrizio is a drum corps journeyman whose career spanned multiple decades, serving as a performer, instructor, arranger, adjudicator and show coordinator for more than 15 groups across the country. These video highlights of Fabrizio's speech, include an introduction by his daughter, Beth. This coming weekend, joining Fabrizio and the more than 75 other members that are among the elite of the DCI Hall of Fame, will be the four new members of the Hall of Fame class of 2007. Those individuals will be recognized during the DCI Annual Meeting & Conference Weekend on Jan. 26 in Orlando. View all members of the DCI Hall of Fame.